Bromeliads high in a tree top. A little more than an hour outside of Quito is a small town known for its hot springs, Papallacta. There are hotels and spas galore, all advertising the best possible experience with hot water or mud baths. And as much as I enjoy sitting in a steaming pool of bubbling mineral water, I really prefer to get out and explore an area first, with camera at hand. Fortunately, we stayed at a place where I had the best of both worlds, Thermas Papallacta. The hotel and spa location gave us easy to access the hiking trail that leads up to a small river tumbling down the mountainside. The trail climbs even higher than the town and the altitude is easy to feel but the views of the valley below make it well worth the effort to start the climb. Once you reach the water, the trail is full of surprises, especially if you have an eye for orchids. Although we hiked in January, a little early for orchids, we saw a surprising number of gorgeous golden sprays of medium sized flowers dancing over the tumbling water. Hidden high in the tree tops, we saw the occasional bright pink or neon purple orchid, well-camoflauged in the speckled sunlight. And climbing up many of the lower tree trunks, we found bunches of the tiniest orchids, each stem a delicate creamy yellow-green with flowers so small it was almost impossible to make out the intricate shape common to all varieties. If we had wanted to keep hiking upward, we could have eventually entered the Cayambe-Coca National Park. An ideal trip would be a day or two of hiking adventures in the park followed by evenings in the hot springs. Guess that will have to wait for the next trip! If you would like to view these photos in a slideshow, click on any one and it will begin! A spray of golden yellow orchids hanging over the river. A dry stone obelisque on the grounds of Thermas Papallactas. Miniature orchids – each stem is about 3 inches long. Orchids are often found in trees like this one. Can you make out the orchids in this one? 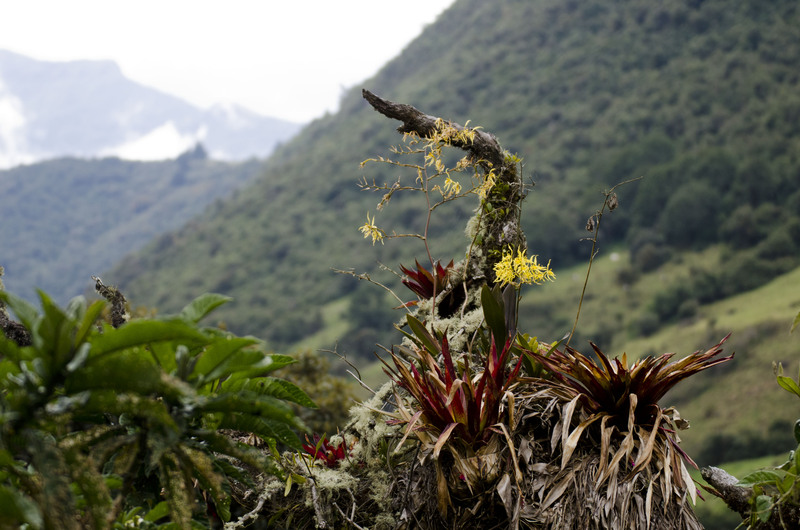 A smaller variety of yellow orchid growing from the crook of a tree. Bromeliads and orchids high in a tree top. A small organic farm at the base of the trail. Close up of Antisana before the clouds take over. The Shining Sunbeam Hummingbird loved the area around the hot springs. The Andes are made up of mountain range after mountain range and it is always stunning to see them lined up all in a row. Antisana in the background; parts of Papallacta on the ridge closest to us. We saw most of this variety of orchid up high but this one was in a garden near the hotel. The trail markers were unique! The hillsides around the hot springs are a brilliant green. Pools outside the rooms at the hotel Thermas Papallactas. Wildlife – lots of little rabbits on the trail but they were awfully quick to disappear. A variety of cone flower. Hot pinky purple orchids that were almost hidden by shadow. Orchids so tiny they are almost impossible to see. Your pictures take me to another world. Thanks for the virtual journey…!! !